Wabash College’s Visiting Artists Series will present Kevin Kling and Simone Perrin at 8 p.m., Monday, October 13, in Salter Concert Hall in the Fine Arts Center. 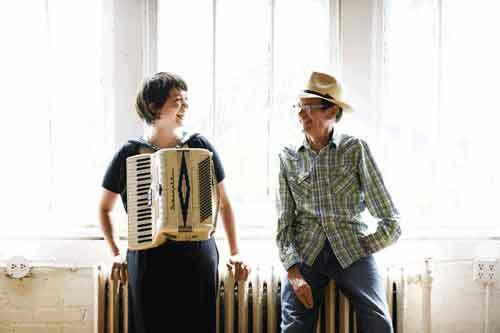 Joining Kling will be Minneapolis-based theater actress, composer, vocalist, and accordionist, Simone Perrin, who has been featured on A Prairie Home Companion. The Visiting Artist Series is funded in part by the Tippecanoe Arts Federation, the Indiana Arts Commission, and the National Endowment for the Arts. Seating for Visiting Artists Series events is by general admission, though free tickets are required. Contact the Fine Arts Center Box Office by email at boxoffice@wabash.edu; or phone: 765-361-6411. The box office will open 90 minutes before curtain time for Visiting Artists events. Tickets not claimed at the Box Office 10 minutes prior to curtain will be released to the general public.